Eric Wilkes Talbot Smith was born on 28 April 1892, the second son of Sydney Talbot Smith and Florence Oliver Chettle who lived at Kensington Park. Sydney Talbot Smith was a solicitor practicing at 20 Currie Street, Adelaide and was committed to community service, with a particular interest in literature and sport. During the First World War he drew up wills, without taking a fee, for over 4000 enlisted men. Smith’s grandfather was Sir Edwin Thomas Smith, a brewer, businessman and politician; he served as mayor of Kensington and Norwood in 1867-70 and 1871-73, mayor of Adelaide (1879-81 and 1886-87), member for East Torrens in the South Australian House of Assembly (1871-93) and member of the Legislative Council for the Southern Districts (1894-1902). ET Smith was also a philanthropist and keen supporter of sport in South Australia; stands at both Adelaide Oval and Norwood Oval are named in his honour. Smith attended the Canterbury House School and St Peter’s College. Subsequently, he attended the Royal Military College at Duntroon, one of the first South Australians to do so. As he was within a year of graduating from Duntroon when war broke out, he was commissioned as a lieutenant. He left South Australia with the first contingent of the 10th Battalion on 20 October 1914 aboard HMAT Ascanius and arrived in Egypt in early December 1914. The 10th were part of the covering force for the landing at Anzac Cove on 25 April 1915 and were first ashore around 4:15 am. 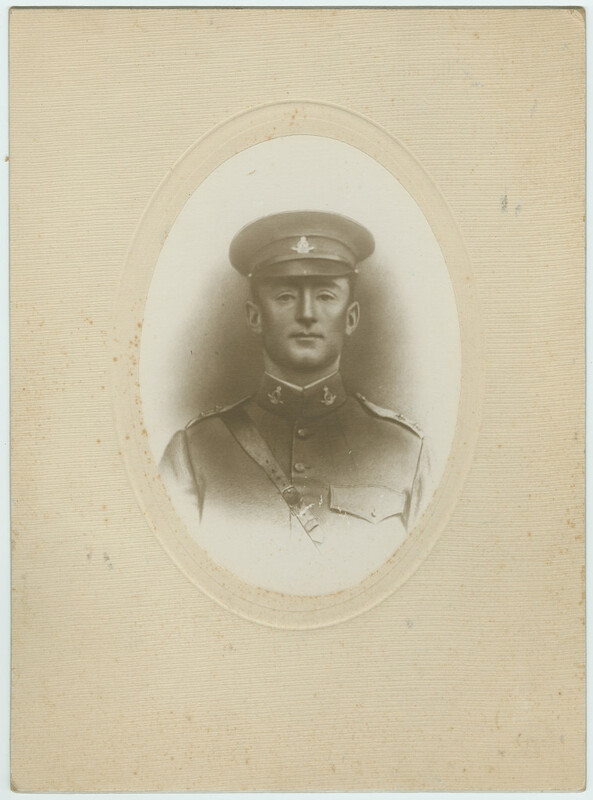 Lieutenant Colonel Stanley Price Weir, Commanding Officer of the 10th Battalion, wrote to Smith’s parents that Lieutenant Smith was in charge of the scouts and later took control of the battalion’s machine guns. All Smith’s men were killed or wounded, yet he continued to man the gun until he received a head wound. Captain Rumball’s eyewitness statement in the South Australian Red Cross Information Bureau packet explains that relief arrived but, as he was thought to be dead, he was not removed for some hours. When he was later found to be living Smith was transported to a hospital ship. Rumball believed Smith died on the ship and was buried at sea, however, he lived to reach Alexandria but died in hospital there. Smith was buried at the Chatby Military and War Memorial Cemetery, Alexandria. He was mentioned in despatches for conspicuous gallantry and valuable services. In one of his letters to the South Australian Red Cross Information Bureau, Smith’s father writes that a witness told him that Smith ‘earned the Victoria Cross if anybody did’.